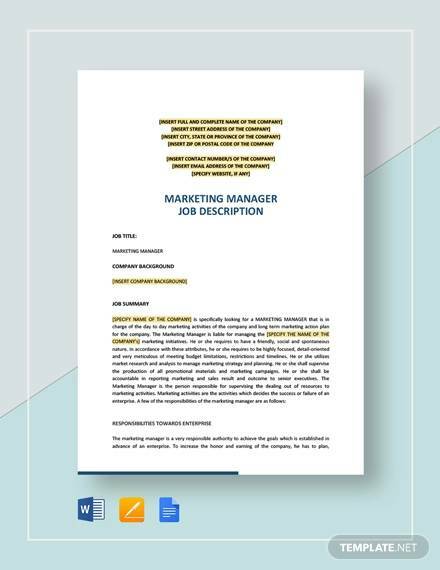 Marketing job descriptions are documents which a company releases when it is recruiting people for a position within the firm’s marketing team. 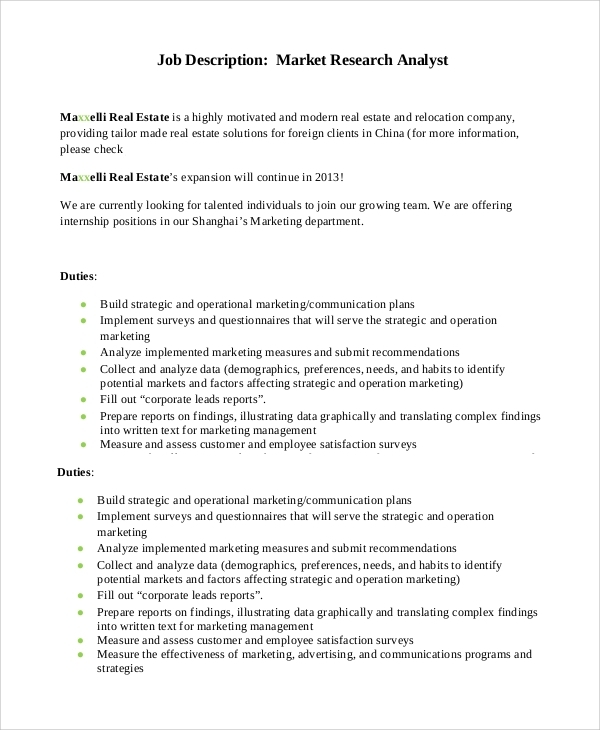 The job description calls for the applicants having a background in the study of commerce and knowledge in the area of marketing operations and ideas. Such Job Description Samples are important because they help the company in finding and recruiting the desired applicants within the firm. 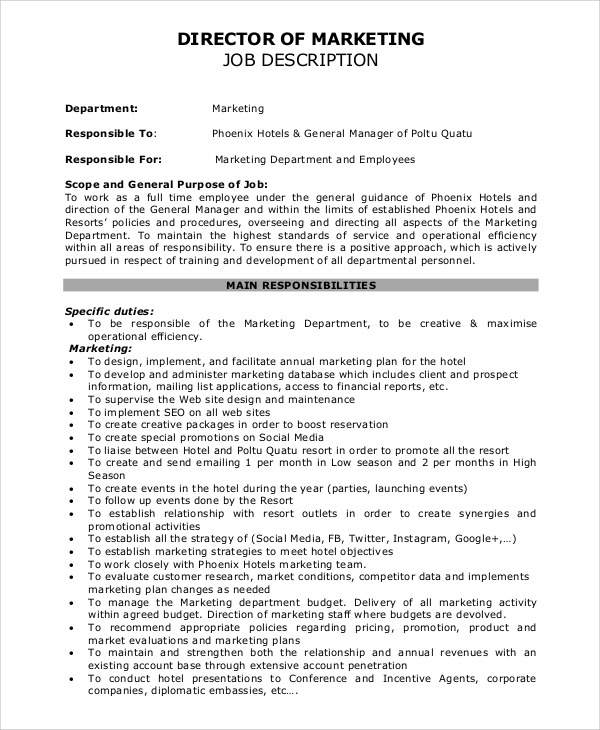 Given below are a list of marketing job description sample templates. A marketing manager is a person who manages the operations of the firm that have got to do with the marketing of goods or services that the firm specializes in. In this regard, the job description template should ask for the applicant to have the qualifications and experience of being a manager and being knowledgeable about how the market operates. 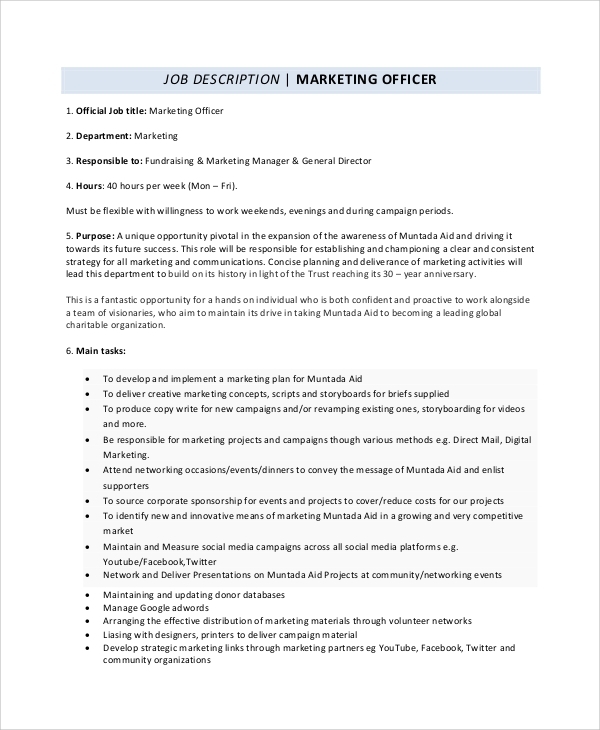 A marketing officer is a person in the marketing team who plans the whole marketing procedure, starting from the advertising to the process by which the goods and services of the company are sold. They coordinate with the marketing managers and the marketing executives to plan the marketing strategy. 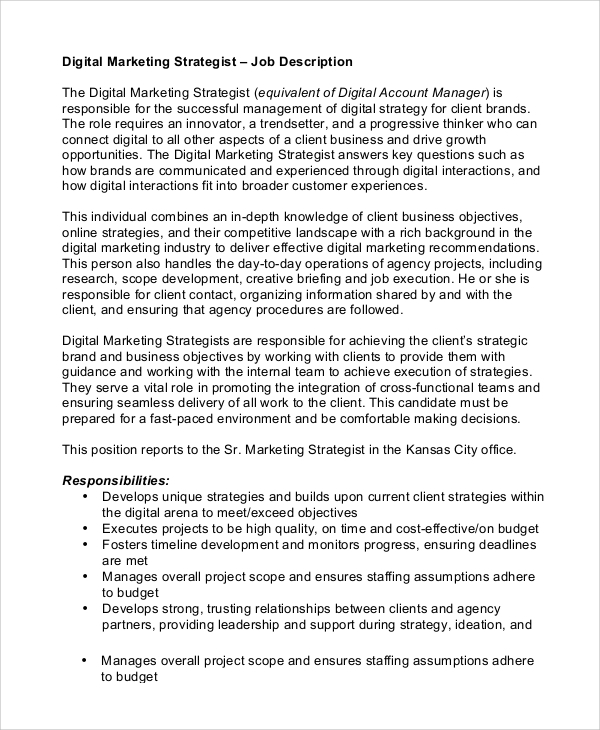 Such a job description should include the applicant’s ability to plan and coordinate. A sales and marketing representative is a functionary within the firm who oversees the sales aspect of the marketing activity of the firm. They observe and report on the number of sales and help to improve the entire marketing process as a whole. 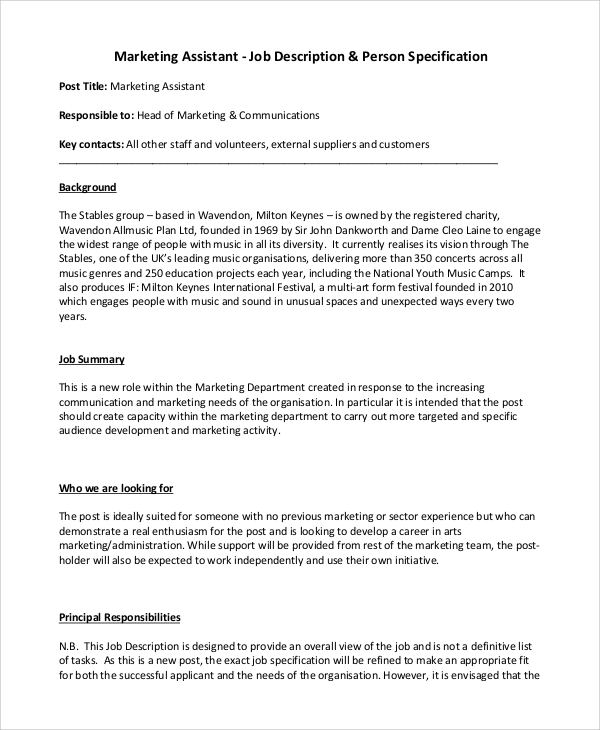 The job description for an applicant applying for this position should include the applicant’s aptitude for the job and their thorough knowledge of marketing operations. A digital marketing executive is a person in the marketing team whose responsibilities include the promotion of the products or services on a digital basis, utilizing the scope and reach of social media platforms. They help in the promotion of the firm and its products online, helping it to reach a wider audience. 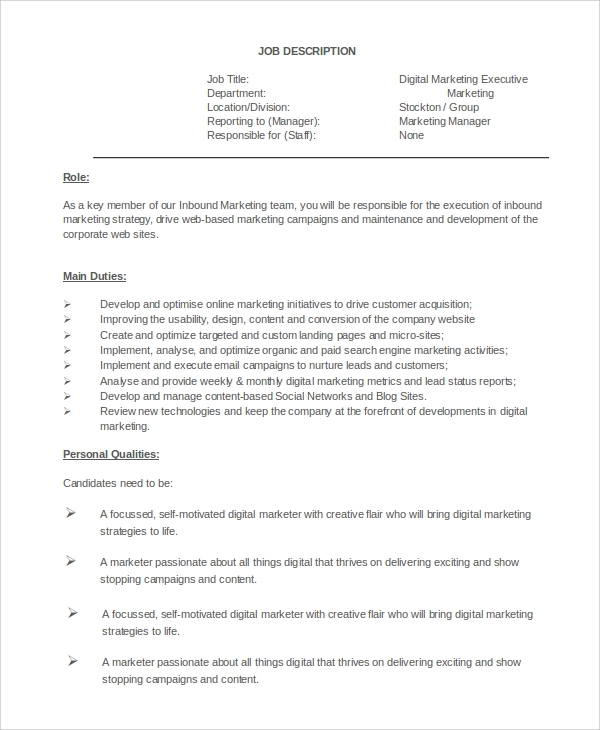 Such a job description should ask for the applicant’s knowledge on networking, the Internet, e-commerce and the processes of digital marketing. A marketing director oversees the entire process of marketing, right from the planning phase to the phase of its actual execution. Marketing directors provide motivation and inspiration to their subordinates and help to resolve the conflicts and deadlocks in the marketing team. 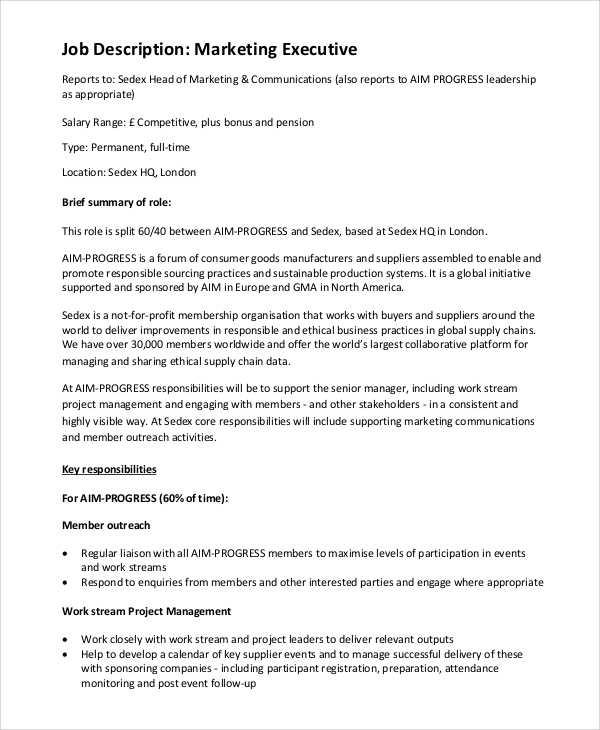 The job description for such a position should call for leadership qualities and thorough grounding in the processes of marketing. 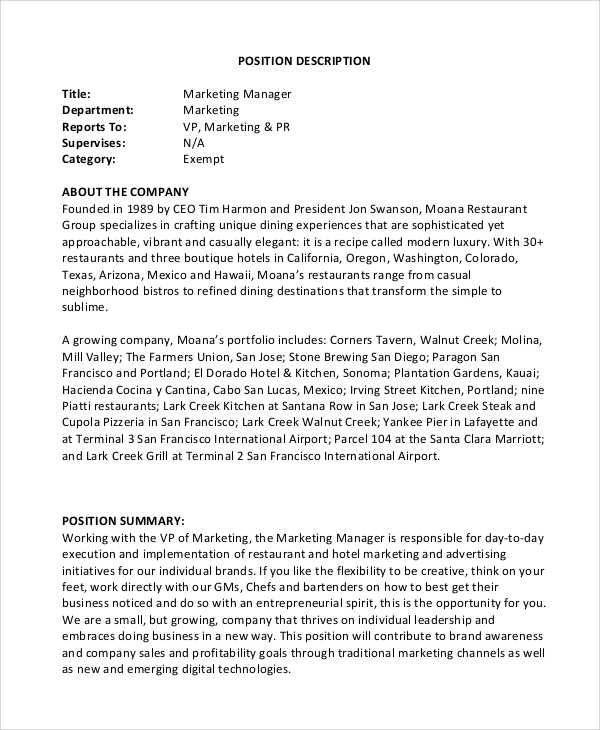 A Marketing Manager Job Description is a useful document as far as the company is concerned, helping them to reach out to those applicants who embody the necessary skill and finesse that the job description demands. They are also important for the prospective candidates because that will enable them to write a proper application and resume in response to the job description. 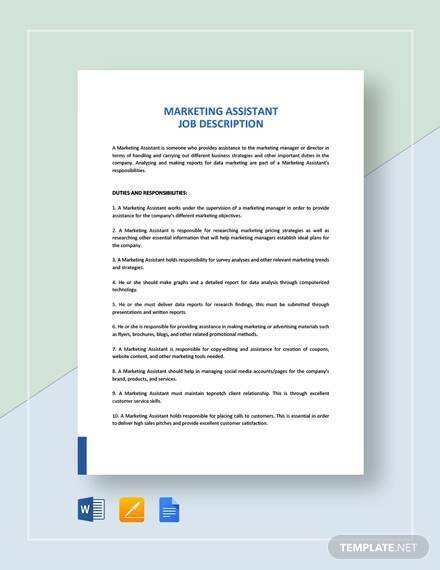 The sample job description templates are aimed towards any and every organization who have a dedicated marketing team and who wish to make their marketing strategy and operations an efficient and a successful process. 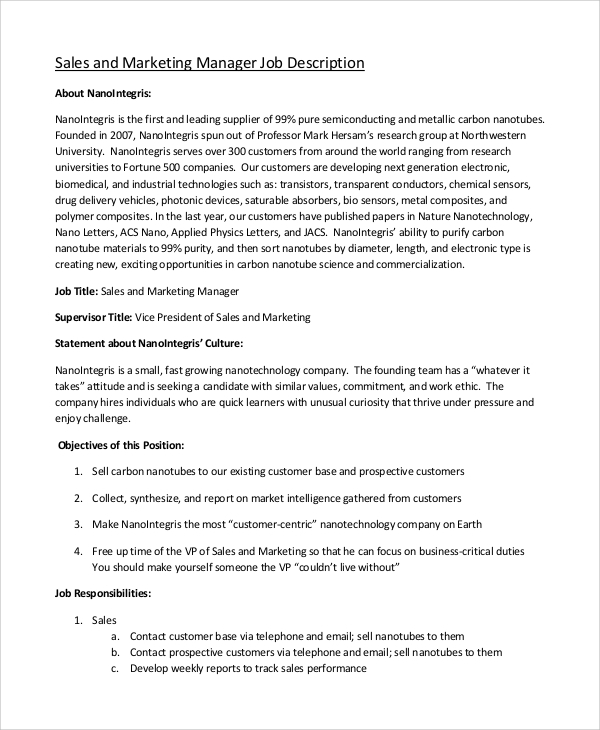 We have an extensive collection of Job Description Templates that will give you a good idea on how good job descriptions can be written. They’re completely editable, and the necessary information need only to be filled in wherever required.